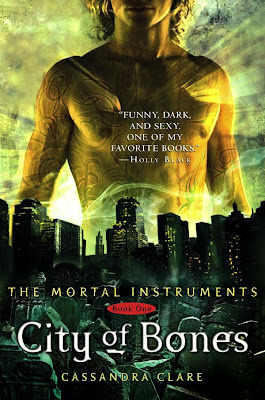 In honor of the movie coming out in August 2013, I thought I’d revisit City of Bones by Cassandra Clare. This an urban fantasy, a genre I’ve somehow only discovered in the last year, and has a cult-like following. The buzz online and almost worship of Clare made me very curious what all the fuss was about. The thing I think I liked best was the gripping and twisty story. It grabs the reader right away with a scene full of action and intrigue. When agents say writers need to hook the reader from the first few pages, they should use this book as an example of how to do it. I enjoyed the characters and how even in this introduction to them and their world, the reader feels invested. Poor Clary spends the whole book finding out that everything she knew about her life is basically completely false and is not only learning the truth, but picking up the pieces. I liked how, unlike many books written for young adults, the parents and other actual adults are central to the story. It felt multidimensional. I also felt totally compelled by the villains and how the reader was always guessing what was going to come next. The world of the shadow hunters that Clare has created is complete and satisfying. I was left wondering what will come next and am very thankful that there are so many other completed volumes in the saga to sate my hunger. There was one tiny element in the ending that rubbed me the wrong way – anyone who has read the book will no doubt know what I mean, but I won’t do a spoiler – but I have a feeling that item has been “taken care of” in the next books. All in all, an excellent read and certainly enough to entice me to keep going. I am curious about the movie for sure, and how the story will measure up to the original. I’ve seen the trailer and lots of still shots from shooting and while I’m not sold on many of the lead cast members (Clary AND Jace for example) I’m sure it will be great.